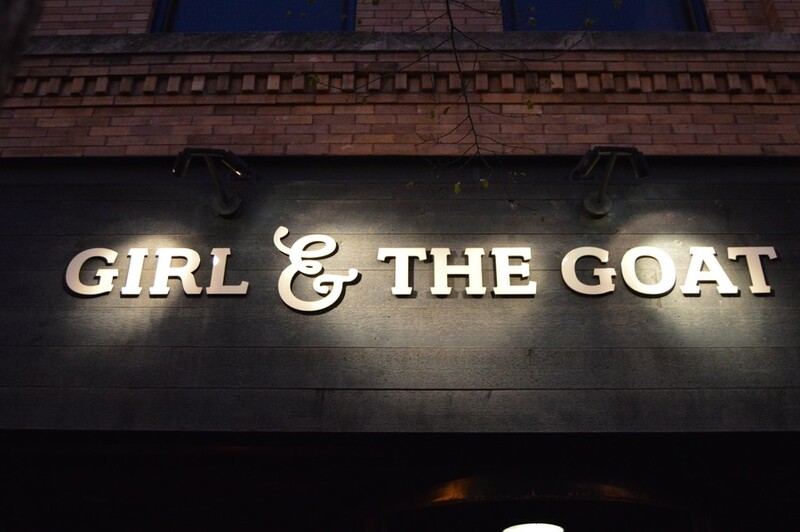 Girl & the Goat is run by Stephanie Izard, winner of Bravo's Top Chef. Shared plate format has come a long way. In select establishments, it achieves comparable prestige to the chef-driven, fine dining operations consisting of eight-plus course tasting menus. The trend sees its downfalls, especially in subpar “tapas” joints serving fist-sized portions that still dig a hole in your wallet. However, thanks to the efforts of big names like Stephanie Izard and Paul Kahan, who directs the well-known institutions Avec and Publican, the bar has been set high for the trend while preserving the boozy nights with good friends and good eats that we all need on occasion. I made a reservation for Girl & the Goat the moment I set foot on campus this spring quarter. I had high expectations walking into Izard’s West Loop flagship restaurant, which stands proudly along the food crawl destination of Randolph Street. With the addition of her modern American diner, Little Goat, and her most recent take on an Asian bistro, Duck Duck Goat, Izard, the first woman to win Bravo’s Top Chef contest, has built a small empire in Chicago and is now a major creative contributor to the Chicago food scene. On multiple occasions, I’ve fondly watched the Munchies: Chef’s Night Out episode dedicated to her, proud that Chicago can tout Stephanie Izard as its own. Plan ahead and bring a few foodie friends to enjoy one of the most famous dining experiences in the city. Miso Hungry ($5): The steaming, light buttery bread looked like cornbread, the white miso in the dough adding a savory undertone that reminded me of the dou fu lu I ate in my childhood (a preparation of fermented tofu curds that is often spread onto Chinese steamed buns, or mantou). The pairing of airy compound miso butter and cooling, acidic kimchi relish was an unlikely combination that was a pleasant starter. I would have preferred a spicier, funkier relish, however. Fried Oysters ($12): Creamy horseradish integrated into a cooked egg-yolk base was appropriately hot, but its combination with the battered oyster inevitably diluted the flavor of the seafood. A solid bite but not particularly interesting. Raw Oysters ($12): The subtly sweet brine of the Kusshi sourced oysters were dominated by pickled shallots and grated raw horseradish. Personally, I would prefer mine not dressed, as the acidic pickling brine was cooking the oysters by the time they arrived at our table. These should be left to the diners to dress themselves. Your money on oysters is better spent at the Publican. Charred Cauliflower ($13): Mint leaves, pine nuts, grated parmesan, and pickled serrano peppers were a winning combination for the tender, crispy florets of cauliflower. My only complaint is that the dish was slightly under-salted and could have used more acidity to contrast the nutty oil. Shishito Peppers ($12): These peppers are my favorite to cook with. When pan-fried until blistered and simply seasoned, these make for great crispy, salty snacks, and the occasional spicy member makes for a culinary game of Russian roulette. Unfortunately, Girl & the Goat’s preparation featured soggy peppers drenched with Parmesan and sesame. Extremely disappointing. 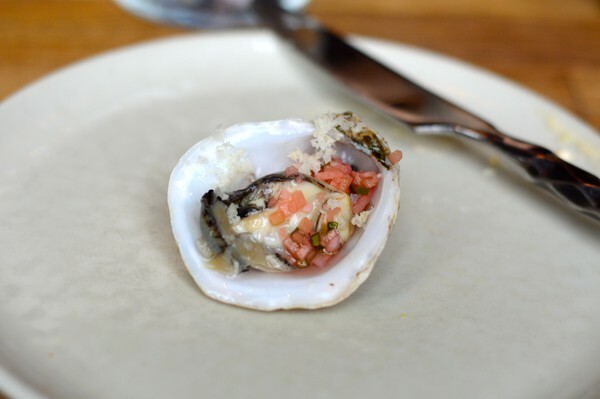 At Girl & the Goat, the oyster is your world. Duck Tongues ($17): This dish was ingenious. Bursting with umami, this plate met crispy but tender duck tongues with bloody tuna tartare and black beans. Peppery arugula furthered the spiced, citrusy piri piri peppers—the whole bite a masterful control over an unintuitive, yet wonderfully balanced flavor profile. My favorite of the night. Pan-Seared Halibut ($19): The taste of the blueberry nuóc châm—a take on the spicy, staple Vietnamese dipping sauce—paired with Marcona almond butter oddly evoked the classic peanut butter and jelly combo but with a lean fish and crunchy white asparagus. I still have conflicted feelings about this dish but would attest that it’s worth a second try. The halibut itself was slightly overcooked, but that’s avoidable. This is the dish that won Izard Top Chef, but I’m still not entirely convinced. Sugo ($19): Though the gemelli pasta was undeniably overcooked, the succulent combination of braised goat, beef, and pork was a memorable sensation that ignited the carnivore in me. Rosemary aioli added a fragrant, garlicky creaminess, and cape gooseberries popped on the palette for what could have turned out to be just an ordinary pasta sauce. Definitely worth another try. Goat Liver Mousse ($14): My party unanimously agreed that this was the peak of the dinner. Velvety goat liver mousse was accompanied by a sticky blueberry jam, smoky pickled grilled mushrooms, and spicy cauliflower giardiniera, reminding me of Sichuan pickled vegetables. The fried yet airy biscuits provided the vessel to create an inspiring array of flavor combinations. The humble, minimalistic plating—featuring each component neatly presented in a ramekin, with the mousse in its own glass jar—lent a certain hominess to the experience that I didn’t experience with the other dishes. Goat Empanadas ($16): This dish featured a solid combination of salty queso fresco—think feta but much less pungent and far more crumbly—and guacamole, served with a refreshing slaw of apples, strawberry, and squash. I’m not quite sure why the blue cheese-miso aioli advertised on the online menu was substituted with guacamole because the combination could have changed my mind about this dish. The empanadas themselves featured succulent shredded goat and an appropriately thin fried wrapper. A decent plate, but definitely not worth the money. Wood Oven Roasted Pig Face ($19): For Girl & the Goat’s quintessential meat entreé, this dish fell short. Perhaps my expectations were too high, but the fatty, crispy pig face and thinly cut potato hash were ultimately lacking in dimension, only accompanied by a creamy maple glaze and sweet tamarind. I was left underwhelmed chewing on what was a muddled bite of unseasoned egg yolk coating the crispy bits of meat and sweet duo of sauces. Even a splash of lemon juice would have salvaged this dish. Confit Goat Belly ($19): Imagine a pool of melted butter, baby-food textured lobster and crab, and out-of-place shaved fennel all piled around a skimped portion of under-seasoned goat belly. I really looked forward to this dish, but all around, it was goat gone bad—very bad. 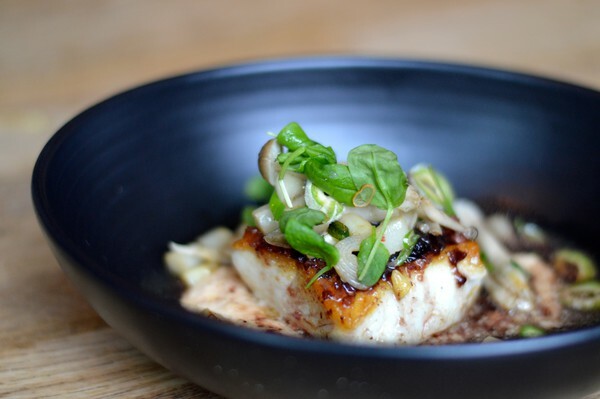 The pan-seared halibut is the dish that secured Izard's first-place finish in Top Chef. 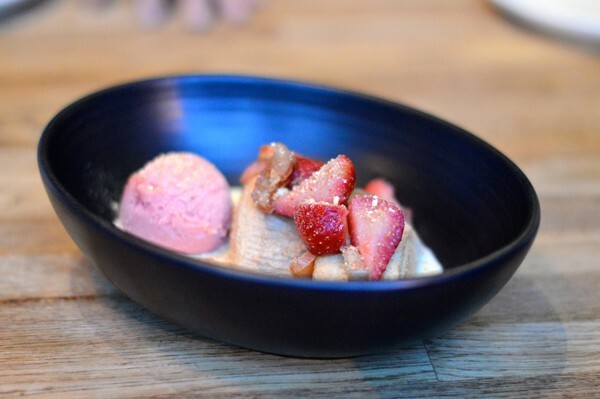 All the Leches Cake ($9): The classic combo of strawberry and rhubarb in the sorbet evoked a sense of spring, and the cake passed the moistness test. However, the pink peppercorn—which may have taken this dessert past the familiar flavors—wasn’t particularly pronounced. While my splurge at Girl & the Goat was arguably not entirely worth the money, I’m glad to cross the experience off of my bucket list. It satisfied my stomach and inspired my own culinary creativity. Due to the financial burden incurred from the ordeal, I may not return anytime soon, especially with no reason to celebrate and a world of different food cultures in Chicago to explore. Tune in next time for Puerto Rican grub and a much more budget-friendly option for your goat cravings. All the Leches Cake evoked "a sense of spring."